Fly line loops & accuracy are important components when teaching fly casting. Just returned from a great weekend at the Atlanta Fly Fishing Show to arrive home to a winter wonderland! This article is intended more for the masses than the loop morphing instructor article published a few weeks back. Hopefully, there will be a few gems to help you improve your own casting. Eventually, you will want an understanding of what happens when you are performing fly casts! 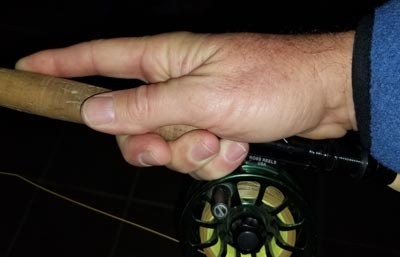 The most common fault overall from the weekend in Atlanta is that 90% of the folks on the casting pond tend to roll the palm outward toward the completion of their back casts. Most of them attempting to throw far on the other end of the casting pond. When the wrist opens up when stopping the rod in back you have introduced another wave into the fly leg of the loop! It will travel in back with a huge kick horizontal and to the right if you are a right-handed caster. It looks cool if you are after the wild west school of fly flinging but absolutely destroys your accuracy in front for hitting a target. You can learn to open the palm with enough practice as long as you can keep the rod tip path tracking straight. This will require more practice typically than keeping the reel pointed straight ahead. When the back cast has a wave introduced to the unrolling loop it will affect the accuracy of the forward cast. This is called a transverse wave. A sure sign to the rotation is viewing the fly reel during the stop of the back cast. Does the reel point straight ahead toward the target? Does it point away perpendicular to the target? 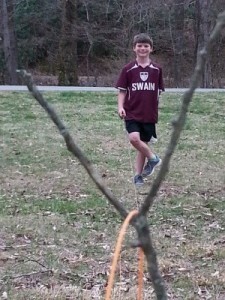 Here is an article on standing waves acting on the string from Stanford University. One of the favorite sites for fly casting geeks is an interactive wave predictor from the University of Colorado. The importance of understanding transverse waves for fly casting is they open up hundreds of casts used in presentation! They also help to diagnose casting faults for tracking and power issues! Usually, the faults come about from errant back casts that do not unroll the line straight. When practicing your casting learn to match the power application necessary for the amount of line being cast! It is common to use more than necessary for the majority of fly casters! This may introduce yet another wave that will cause the end of the line to kick when the fly line straightens. This kick off the end of a line is also reflected with a wave traveling back on the forward cast. This wave is equally important to eliminate as those caused by tracking issues. The more accurate you learn to cast the more enjoyment you will have to catch fish! Casting accurately to likely holding spots, sight fishing specific fish, or a methodical gridding off will all require precision. It is much easier to keep the rod tracking straight by using the three-point grip with the index finger laid straight on the cork. The index finger guides the entire rod straight. It is my preferred grip for most of my fly casting. The grip helps new fly casters develop an awareness of where they point the rod tip. There is a natural tendency for rod pointing with the index finger. No one instinctively learns to point with the thumb! It also helps to teach pulling the rod through the cast as opposed to those fly casters that force rod turnover. The little finger pulls the rod into the stop just like the bottom hand used for making Spey Casts. You can find more about the grip by checking out my friend Jason Borger’s new book Single-Handed Fly Casting! It is excellent and I am sure you will benefit greatly from reading it. It was great to catch up with Gary Borger in Atlanta the past few days and discuss fly casting with him! How Fly Rods Affect Tracking Distance Casters? There are times when a fly rod simply cannot handle the amount of weight and forces for elite distance casters. The tip deviates during the unloading phase of the cast. This creates a transverse wave into the forward cast and usually throws a wild curve upon turnover. The solution is to switch to heavier rod weight! It is all about matching the proper tool for the job at hand! This is not of concern for the small stream trout fisherman! It does become more important for the lake fisherman and saltwater anglers which requires longer fly casts.